As one of nature’s super foods, almonds’ health benefits are numerous. Almonds are the perfect in-between meal snack since they satisfy your hunger without sacrificing your health. Of all the nuts, almonds are king in the nutrition department. Almonds are higher in nutrition than any other nut. Containing calcium, vitamin E, magnesium, iron, phosphorus, niacin, selenium, zinc, and copper, almonds are considered a super food. Regular consumption of almonds can lower your cholesterol. By increasing HDL, the good cholesterol, and decreasing LDL, the bad cholesterol, almonds’ health benefits for your heart is obvious. One of the many health benefits of including almonds in your diet is cancer prevention. Because they are so high in fiber, almonds help food move more efficiently through the colon, thereby preventing colon cancer. 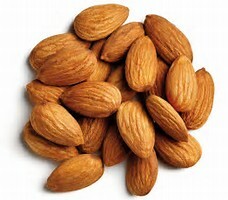 Eating almonds daily will keep your blood sugar levels regulated. This health benefit can prevent diabetes. Make sure you eat only raw almonds, never sweetened or flavored almonds, if you have elevated blood sugar levels. Almonds give you instant energy. Because they are so high in minerals, almonds produce energy and increase stamina. You may have noticed that many beauty products contain almond oil or almond milk. For centuries almonds’ health benefits for the skin have been well known. Almonds have a healing, wrinkle reducing effect on the skin. Almonds are great brain food. Because they are so high in vitamin E and minerals, almonds are actually recommended for children in the development of their intellectual level. Almonds regulate blood pressure. Due to their high levels of potassium and low level of salt, eating almonds can actually lower blood pressure. Remember to eat only unsalted almonds if you have been diagnosed with high blood pressure. Almonds are high in folic acid. Scientific studies have shown that folic acid taken during pregnancy reduces the risk of certain birth defects. Almonds help with weight loss. Because they are high in fiber and nutrients, and low in bad fats and calories, almonds can be your best friend if you are trying to lose weight. Another health benefit of almonds when trying to lose weight is that a very small amount will make you feel full so that you don’t overeat.